Moki Kokoris has been writing about Arctic topics for many years. 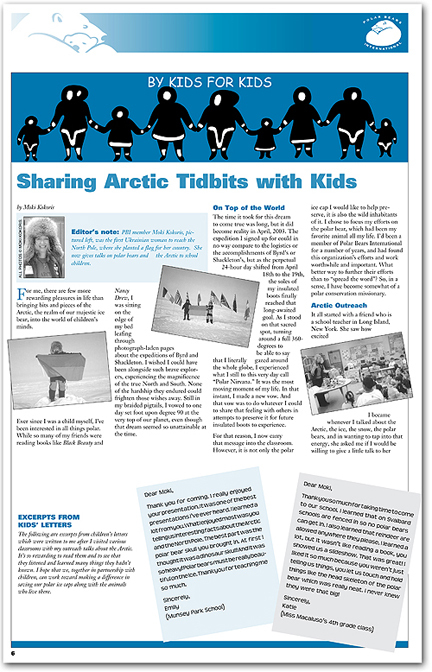 In 2007, she began a series of articles about the indigenous peoples of the Far North, which have been published in The Polar Times - journal of the American Polar Society. She has been contributing author to Indigenous Policy – journal of the Indigenous Studies Network, to World Ecology Report – Promoting Health and Environmental Literacy, and she has written for The Arctic Institute | Center for Circumpolar Security Studies. Additionally she is a regular contributor to the Scientists and Explorers Blog for Polar Bears International. Please visit the Articles and Blog Posts webpages for a sampling of these publications.